The Vietnam War, Through Eddie Adams' Lens Adams photographed 13 wars, and made some of the most iconic images of the Vietnam War. But the Pulitzer Prize he won for one photograph left him conflicted for the rest of his life. Disclaimer: This story and accompanying slideshow contain graphic depictions of war. The late photographer Eddie Adams took pictures of hundreds of celebrities and politicians — everyone from Fidel Castro to Mother Teresa to Arnold Schwarzenegger (whom he captured in a bathtub with a rubber duck) — but some of his most searing portraits come from his work during the Vietnam War. One photo is so iconic that it is the picture most people think of when they think of Vietnam: a Vietnamese general in Saigon executing a Viet Cong suspect. But the Pulitzer Prize Adams won for this photograph left him pained and conflicted for the rest of his life. Adams died of Lou Gehrig's disease in 2004. His war photographs were never published in a book during his lifetime — people who knew him say the photographer had an intense desire to be perfect, so book projects were always delayed. Now, four-and-a-half years after his death, Eddie Adams: Vietnam presents a collection of his photographs from the war, and the Umbrage Gallery in Brooklyn is hosting an exhibition of his work, which runs until April 30. Hal Buell, who ran The Associated Press photo service for 23 years, says the Vietnam War was a turning point for war photographers like Adams. "No war was ever photographed the way Vietnam was, and no war will ever be photographed again the way Vietnam was photographed," he says. There was no censorship. All a photographer had to do, says Buell, "is convince a helicopter pilot to let him get on board a chopper going out to a battle scene. So photographers had incredible access, which you don't get anymore." Adams' close-up portraits and emphasis on intimate storytelling presented a new way to photograph war. One portrait shows a marine with an intense expression out in the field on the phone, perhaps calling for air support. There's a picture of soldiers coming into a village — your eyes focus on a woman and her child trying to flee. There's a young Vietnamese man being interrogated, a spear pointed at his throat. Former AP and CNN correspondent Peter Arnett was with Adams in Vietnam. He says that some 60 journalists and photographers were killed in Vietnam, but even so, there were always enthusiastic young reporters and photographers eager to take their places. "This was the last great wire service war, and there was enormous competition between UPI and AP," explains Arnett. Because of the draft, says Arnett, most journalists chronicling Vietnam had been in the military. They could relate to the troops and had a better understanding of what was going on. Adams, who had been a combat photographer with the U.S. Marine Corps in Korea, loved the Marines, and many of his best photographs are of Marine operations. 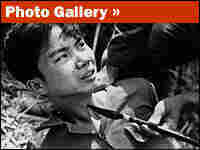 But his most famous and most disturbing photograph was shot on the streets of Cholon, the Chinese section of Saigon. The incident took place on the second day of the Tet Offensive in 1968, a watershed battle that changed public perceptions of the war. Adams saw a soldier drag a man in a checkered shirt out of a building. 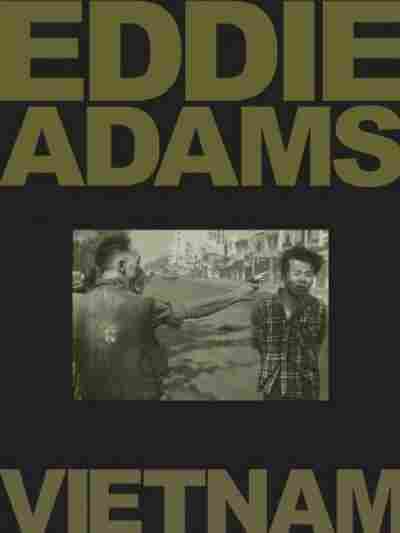 In the documentary An Unlikely Weapon: The Eddie Adams Story, Adams describes what happened. "They were taking him by the hand and pulled him out in the street," he said. "Now any photographer, when you grab a prisoner, in New York or something, you just follow him, and it's a picture. You follow until he is put into a wagon and driven away." But walking into the frame of his camera was Brig. Gen. Nguyen Ngoc Loan, raising a pistol. Normally, that was a method of interrogation — holding a weapon to a suspect's head and asking questions. As Buell tells it, "This man just raised the pistol and Eddie made a picture of an interrogation, but the man pulled the trigger." One of Adams' frames was the very instant the bullet entered the man's head — the moment of death. The picture went around the world. It was held up at demonstrations by members of the intensifying anti-war movement and became one of the two or three iconic photos that symbolized the war for many people. Ironically, there are films of that same execution. But Buell and Arnett both argue that the still photo had more of an impact. "You can see the gun, you can see the expression on the man's face as the bullet enters his head, and you see the soldier on the left who is wincing at the thing that has happened," says Buell. "With the still picture, you have time to consider all these factors." Arnett calls the picture a "brilliant piece of photography. He had the courage to stand a foot or two away from a murderous officer who had his pistol out and shot the man in front of him." But Adams, who considered himself a patriot and a Marine, never came to terms with the fact that the anti-war movement saw that photograph as proof that the Vietnam War was unjustified. In fact, he believed to the end of his life that the picture only told part of the truth. The untold story was that on the day of the execution, an aid to Loan was killed by insurgents. After Loan pulled the trigger, he walked by Adams and said, "They killed many of our people and many of yours." In An Unlikely Weapon, Adams said he found the attention given to this photo disturbing: "I still don't understand to this day why it was so important, because I have heard so many different versions of what this picture did, like it helped end the war in Vietnam."